Superior Spider-Man #16 is indicative of how once writer Dan Slott and the rest of the title’s creative team put their focus exclusively on telling a compelling story, rather than hard-selling Spider Ock and his exponentially growing role in the Marvel universe, the end result is a quality comic book arc that hits some really interesting beats and amps me up for the next story. What makes Superior #16 a fairly special Spider-Man comic is how expertly tension is built by Slott and Humberto Ramos’s artwork. 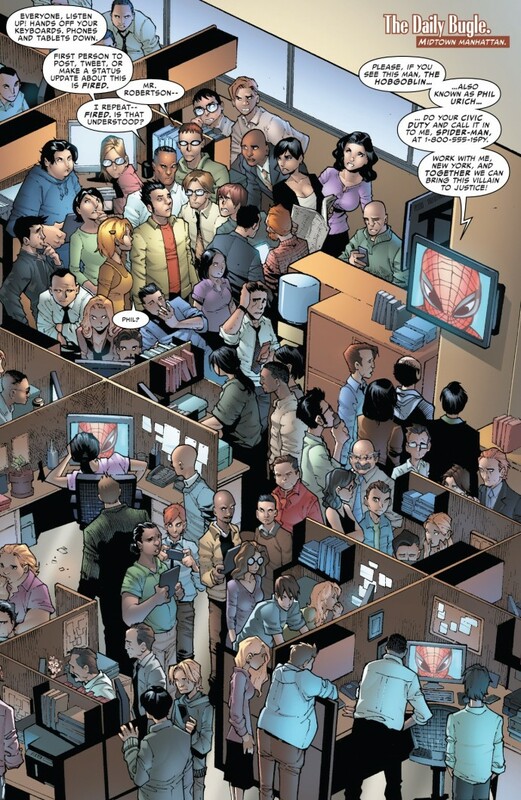 Setting the bulk of the story inside the Daily Bugle newsroom in the moments after everyone in New York City discovers that reporter Phil Urich is the Hobgoblin is a phenomenal choice by the creative team. The unpredictability of this story – how would Phil’s colleagues react? Would Phil snap? 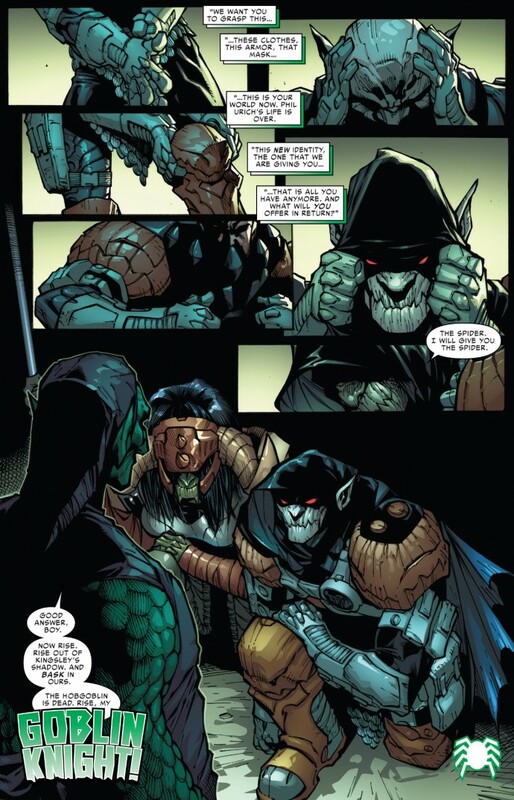 Would Spider Ock kill Hobgoblin? – makes the comic a good old-fashioned page turner. In simplest terms, these are the kinds of stories that make me a comic book fan. I find it very interesting to compare how story is built and elevated in Superior #16 when compared to the “No Way Out” arc that took place at the Raft prison a few issues ago – a storyline I’m becoming increasingly more sour towards as time marches on. During “No Way Out,” which was plotted by Slott but scripted by Christos Gage, the entire encounter takes place within the suffocating confines of a super-prison, but because the focus of the arc was more on super-powered one-note heroes and villains rather than real characters with histories and personalities, any tension that existed felt artificial. Additionally, during that arc, Spider Ock had an answer for everything and was never in true peril, J. Jonah Jameson was at his totalitarian-worst, and the featured villains were presented in uninteresting ways. 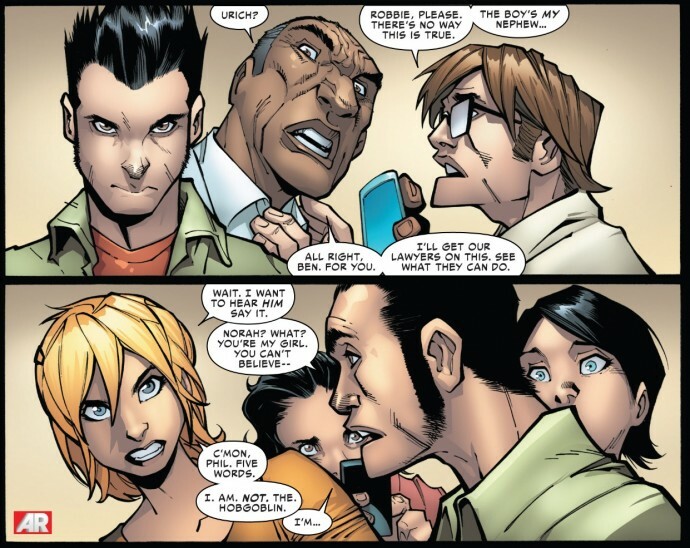 In Superior #16, we get nice moments from some all-time great Spider-Man supporting cast members, like Joe “Robbie” Robertson scolding Spider Ock for creating a “pressure cooker” by broadcasting across NYC that he knew the Hobgoblin’s identity – a decision that Peter Parker, a man who respects the sacredness of a secret identity, would NEVER do – or Ben Urich feeling shock and dismay about his nephew’s potential double-life as a supervillain. While it’s the ups and downs of the titular superhero that hook us into comic books in the first place, on a personal level its Spider-Man’s supporting cast that made me pledge loyalty to that specific character’s world. Robbie and Ben are two of the best supporting characters out there – and my time spent as a newspaper reporter for five years may also be factoring in with my bias here – so I was thrilled to Slott wrote those scenes and Ramos did a great job visually capturing the emotional beats. 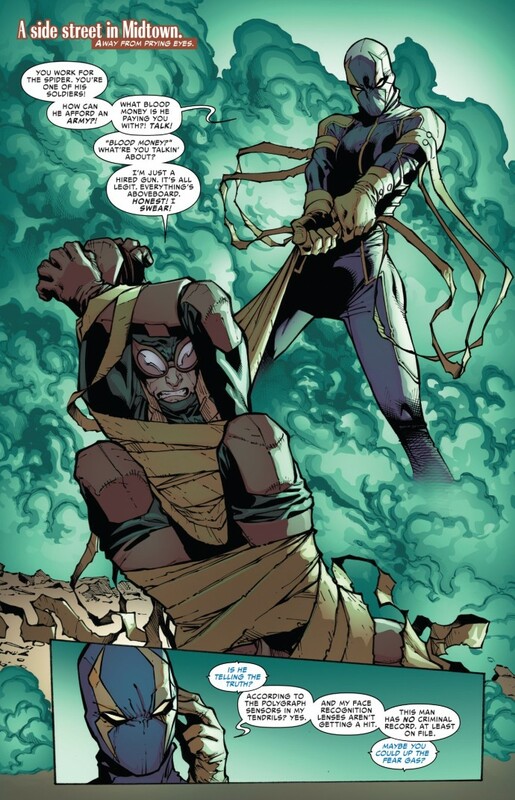 But beyond the supporting cast, Slott did a terrific job keeping me guessing during the conflict. By essentially cornering Phil in a confined newsroom around all of his peers and colleagues I had no idea how the situation would be inevitably resolved. Just when I thought Phil would play it cool and keep the Daily Bugle staff on his side, his character went full supervillain, grabbing his girlfriend Norah Winters as hostage before unleashing his sonic laugh in the newsroom. 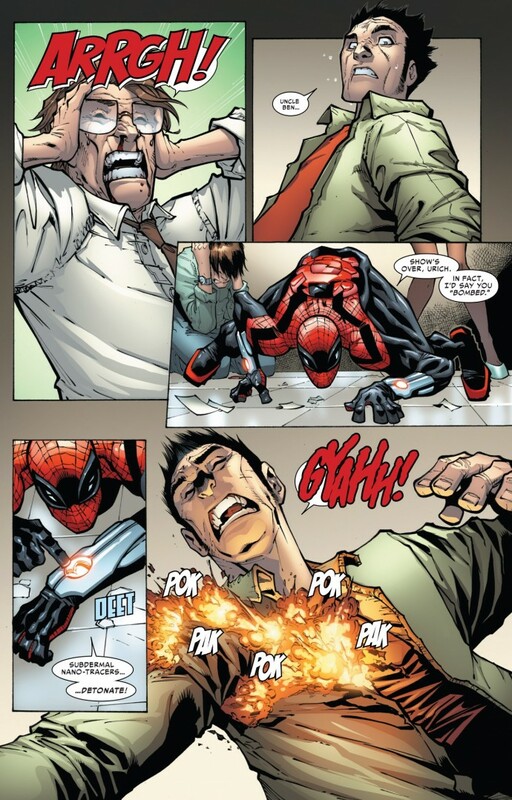 But then Slott/Ramos took a hard left and captured yet another great emotional beat when Phil cried out for his “Uncle Ben” (a very intentional parallel to Peter I would have to think) after seeing how his laugh was hurting him. 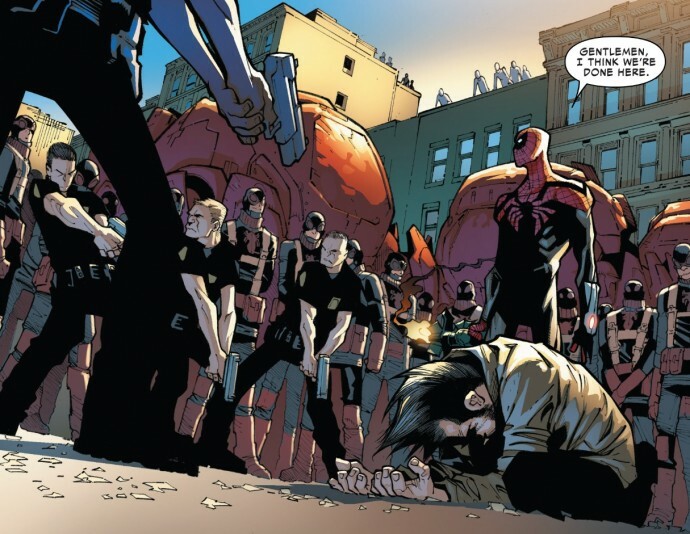 As a reader, I was still rooting for Phil to be brought to justice, but I also sympathized with the fact that Spider Ock’s fascist crime-fighting tactics (and apparently, he’s on notice from Captain America and the Avengers again – can we please come up with an idea and stick with it on this subplot?) cornered Phil like a wild animal and all but dared him to lash out the way he did. 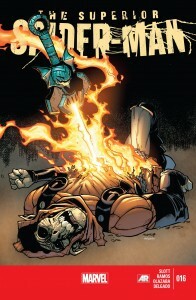 Making your characters vulnerable: what a refreshing concept after the Michael Bay experience that was Superior #11-14. I’m six paragraphs deep into this post and I still haven’t given much ink to Spider Ock. He’s really not a central character in this story, as Phil, Robbie and the Bugle staff are much more compelling for the readers. And yet Slott gives us a nice Spider Ock moment at the end when he’s holding the defeated villain’s flaming sword and I think everyone is pretty much waiting on him to bring it down on Phil like he was Ned Stark. Instead, Spider Ock leaves it to the authorities (who of course let Phil escape, so it will be interested to see if Otto ever does THAT again) and the entire story, for a brief moment, almost feels like we’re back in the Parker-era again. The creative team then sets up the next major story (which I assume will take place after the two-part Spider-Man 2099 arc in September) by bringing back Menace and reinventing Phil as the Green Goblin’s “knight.” People keep going back on forth about who the Green Goblin may be, and while there’s still no reason to believe it’s NOT Norman Osborn, the whole royalty motif being set-up here would suggest something vastly different. Either way, after months of very little movement on this subplot, Slott finally seems to be pulling the trigger on some things. Now let’s see it continue. I’m also going to casually ignore the cold-hearted way Robbie fired Norah and put Ben on leave after the Hobgoblin story is resolved. I guess Slott is trying to show the consequences of Spider Ock’s shoot first ask questions later style of heroism, but it still felt like a bizarre character moment from Robbie. But I’ve already been on record since the Superior Spider-Man era kicked off in January in saying I wouldn’t scoff too much at what Slott is doing until we’re well past a resolution. It’s difficult to expect a creative team to be on point 100 percent of the time, but there was enough characterization and drama throughout Superior #16 that I would really be a creep if I allowed one wacky Robbie moment and/or the most overly-complicated police investigation to ever take place in a comic book have a legitimate impact on my reading experience.